Aries January 2018 Horoscope foretells that professional interests are in centre stage this month. More than 80 percent of the planets are in the upper half of the chart. The House of Career is quite dominant with majority of planets while the House of Family has no strength. Independence of thought and action will rule the Aries zodiac sign this month as eastern half of the chart is powerful. Your way is the high way and you are not dependent on your social skills. Your assertive nature will be prominent and you can script your destiny to suit your ambitions. January 2018 Aries career horoscope is predicting that you are focussing on your career prospects this month. You are likely to be hindered by the unfavourable movement of planet Saturn. This requires more effort from your side to progress in your profession financially. Whatever financial benefits you are accruing with your professional efforts will indirectly benefit the family. The family will enjoy your progress in your career and will relish your change in status. Aries students and academic professionals will be in for drastic changes in their educational life in January 2018. There may be changes in the curriculum or educational institutions. 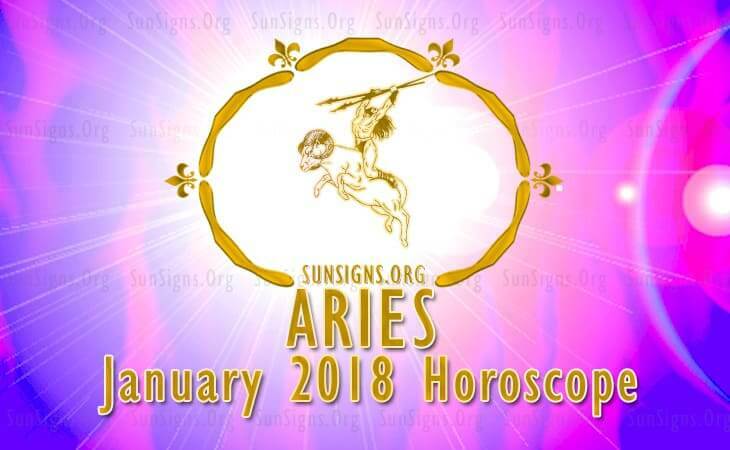 Aries 2018 January forecasts for finance indicate to a highly profitable month and you may be aided by friends. Travel will bring you many financial opportunities. The 2018 astrology predictions foretell that this month is not auspicious for speculative ventures for the Ram. Aries love January 2018 horoscope predicts that planetary positions are forcing you to concentrate on your career and family affairs take a back seat during the month. The Solar Eclipse of the 26th will impact your existing friendships and you may go in for new friendships. The eclipse will tend to change your religious ideologies. If you are in a relationship, you may not have enough time to devote to your partner. This may be a source of friction in the relationship. Single Arians are likely to find love in their professional circles. Marriages are not likely during the month of January 2018. Pregnancy and children related issues need some attention. Affairs of children are likely to pose some problems for the family in January 2018. You have to encourage your children to pursue their studies more vigorously says this 2018 monthly horoscope. The 2018 January monthly zodiac horoscopes predict that health will be somewhat problematic till the 19th of the month. You have to relax as much as possible. Rest of the month will be enjoyable. January 2018 Aries horoscope foretells that this is a month for good business deals and professional success. See Rashifal 2018.